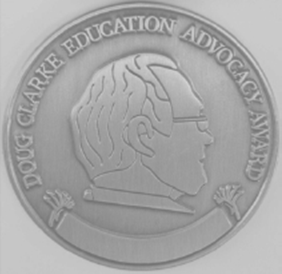 In 2008, the RSWA Council resolved to honour the life of Doug Clarke by initiating ‘The Doug Clarke Education Advocacy Award Medal’ of the Society. This award recognises the outstanding contribution to science education made by Doug Clarke from Murdoch University. Clarke performed hundreds of chemistry shows at schools and regularly appeared on television. He inspired thousands of school children in the wonders of science, and assisted undergraduates and postgraduates. The inaugural award was presented to Doug Clarke at the Annual General Meeting of the Society in 2008. Eligible recipients can be Primary or Secondary School Teachers or University Teaching Staff. Doug joined Murdoch University as a founding Member and Senior Technician in the School of Mathematics and Physics (MPS). By the end of 1975 Doug had been promoted to Professional Officer to enable him to undertake independent research, demonstrate, lecture, and co-supervise honours and postgraduate students. During his time at Murdoch University Doug’s work knew no boundaries. Doug was responsible for Occupational health and Safety, helped to establish a large number of courses, and was the major contributor to Laboratory Manuals, and lectured in many of them. Theatre UWA (receiving commendations from Professor Don Watts and others), was involved in many Chemistry research programmes including Jim Parker’s copper process, Lithium battery, Bromine battery, the Eucalyptus Project, and many others. All the while he also helped students in many research projects in Physics and other University Schools, and assisted staff and students in other schools to purchase specialist instruments and provide training. Having performed hundreds of chemistry magic shows at schools and regularly appearing on television, Doug has inspired thousands of school children, assisted thousands of undergraduate and postgraduate students and made an incalculable contribution to research and innovation. However, on a day-to-day level, Doug will always be fondly remembered by hundreds of staff and students as the “Mr Chemical Fixit” for his problem solving abilities and his deep and broad knowledge of all things chemical. 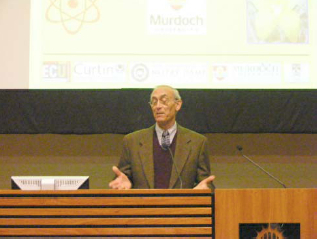 In 2008 Doug retired from his position as Professional Officer in the Chemistry Department at Murdoch University.